Miles away from the club sound of her first EP ‘Klabb’, Deena Abdelwahed introduces us to the a darker and more introspective side of her music. Abdelwahed’s style is a perfect fit for the label; co-founded by French DJ and producer, Agoria, it has developed a reputation for steering clear of the ‘known’ when it comes to electronic music and playing a part in redefining techno and house. 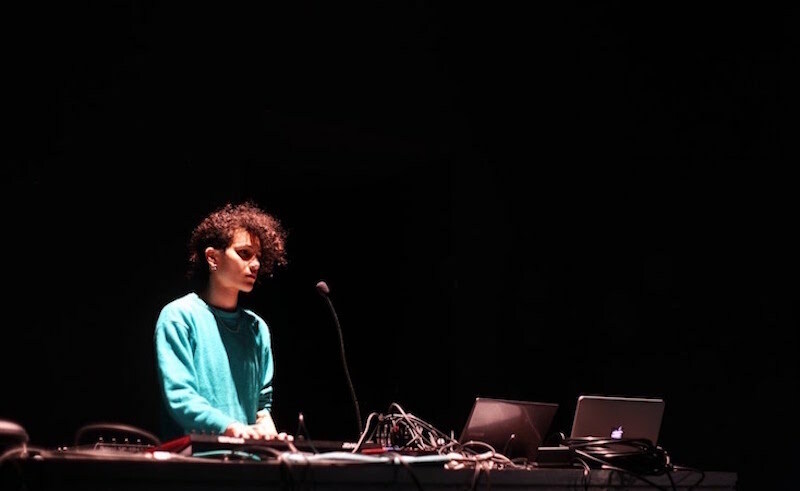 Abdelwahed is by no means new to the electronic music scene; in fact, she is considered an underground star of the Tunisian alternative music scene, where she has won plenty of fans for her innovation and experimentation. Before she united with the InFiné team in 2016, she was as part of the World Full of Bass collective in Tunis. In 2017, she released EP, Klabb, on the label and has since penetrated the international scene, playing everywhere between Boiler Room and Berghain. Long-awaited by fans, the LP serves as further proof of her innovative and experimental style. While both Klabb and Khonnar combine North African and Middle Eastern sound elements with electronic music, latter is by far more club-oriented, but still introspective in approach with the 45 minute-long piece of art aiming to break down the codes of bass, techno and experimental music. The opener, ‘Saratan’, is a shamanic doom-techno track that varies between spiritual sounds and ceremonial mumblings. It’s intense track that sets the dark approach of the album in motion and leaves listeners in an unknown state of restlessness. While ‘Abadad’ more or less follows the same idea, ‘Tawa’ - which translates to ‘Now’ - brings back the North African and Middle Eastern inspired sounds that have come to define much of her style. Rhythmic drum machines and Arabian melodies are packed into a pure instrumental that still keeps the brain spinning with its troubled mood. ‘Fdhiha’ - or ‘Scandal’ - keeps the North African vibes and pairs them with Abdelwahed’s calm vocals. An amazing and much appreciated extra to this calm and cadenced, yet intense, track is that it also features a musician playing the Bendir – a traditional Tunisian percussive instrument. The highest level of disturbia of the album is finally reached with ‘Ken Skett’, which allows neither the brain nor the body any rest, thanks to the hum of a swarm insects, but ‘Al Hobb Al Mouharreb’ makes up for this uncomfortable feeling - at least a bit. The track is based on a poem by Egyptian writer and chanter, Abdullah Miniaway, with whom the artist worked with on two tracks and is considerably more calming thanks to the rhythmic drums and soft vocals. So far, a sweet feeling of discomfort washed over the album - but, it's also at this point that you realise that Abdelwahed was just getting started and intelligent dance music track called ‘5’5’ ups the ante with the experimentation and, subsequently, that sweet feeling of discomfort. This then leads to the longest track of the album, ‘A Scream in Consciousness’, as the experimental streak continues. The title given to the song encapsulates the concept quite well - noise meets noise meets noise. The album closes with ‘Rabbouni’, the second collaboration with Miniawy, who lends his vocals this time. Pairing classic Arabic instrumentation with an unsteady yet catchy beat, this one takes us back to the much appreciated shamanic vibes of the beginning, closing the loop perfectly on what is a unique aural experience that is equal parts intelligent and visceral. Beware, though - this is not the Deena Abdelwahed like you might have known her on Klabb. So get comfortable with the uncomfortable and be prepared for a sound adventure that is more likely to be the next soundtrack to a Ayahuasca trip than to a night out. Follow Deena Abdelwahed on Facebook, Instagram and Soundcloud.